About - Write Brothers, Inc.
Rather than stifle creativity, Write Brothers believes that the computer has given people unprecedented freedom to create, develop, and implement new ideas and inspirations. We are the first and the only creative team ever to receive an Academy Technical Achievement Award for screenwriting software. Our President is a produced Hollywood writer and WGA member. We are the only company with software for all phases of writing: creativity, brainstorming, outlining, and formatting. Our top-selling Dramatica®, Movie Magic® Screenwriter™, and Outline 4D™ writing programs are used by leading novelists, fiction writers, screenwriters, and playwrights. For more information, Sales, and Customer Service, call 818-843-6557. For Technical Support, please visit our technical support contact page and submit a request. Our technical support staff will then be of assistance. To Contact Technical Support Click Here. Who are the Write Brothers®? Way back in the previous century, in the golden age of computing, Stephen and Christopher (aka the "Write Brothers") set up shop in a 10' by 10' office in the hundred year-old Block Building, the first brick building erected in the City of Burbank. It was March 11th, nineteen hundred and eighty-two. From that date, the process of creative writing on a computer would never be the same, because the Write Brothers were about to invent a whole new category of software!! Back in those days, state of the art was a computer with a 5 megabyte hard disk, and 64K (that's K, not MB) of RAM. Did these limitations deter the Write Brothers? Well, sort of. Stephen had boastfully estimated that their first program would take "two, maybe three weeks" to complete. He would only be off by nine months. Being so late delivering their first software project taught the Write Brothers a valuable lesson: it doesn't matter how long you plan the project to last, it will always be late. 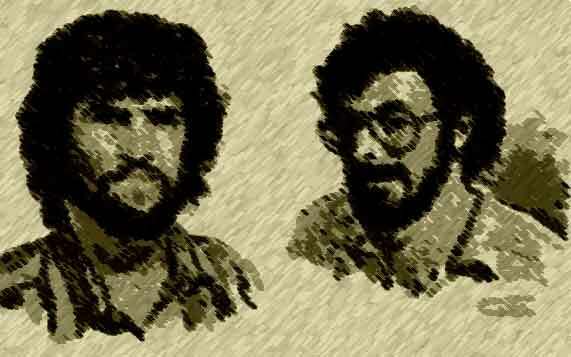 In January of 1983 the two were ready to unveil their first software creation: Scriptor™, the first screenplay formatter. Did screenwriters of the world line up to buy this marvelous invention? Nope. Turns out the software was priced too high ($495!) Lesson #2: price software to be affordable. After several months of testing prices, Scriptor settled in at $295, and there it stayed for the next ten years. Scriptor™ quickly became the industry standard formatter for motion picture screenwriting professionals and novices alike. 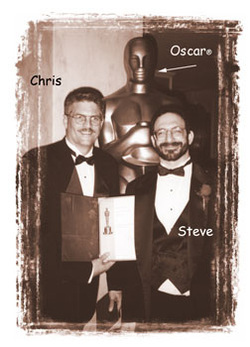 In 1994, Christopher and Stephen were honored with the first (and only) Academy Technical Achievement Award granted to a screenwriting program! Bitten by the software invention bug, the two intrepid entrepreneurs developed more software tools for the creative process, including Movie Magic® Budgeting (1985) and Movie Magic® Scheduling/Breakdown (1987), which were nominated for Academy Technical Achievement Awards. These program quickly became the industry standard tools for the production of film and television. Over 90% of the films you've seen in the last ten years used software originally developed by Chris and Steve. As the first years of the last decade of the previous century began (that was 1990), the two inventors found themselves drawn back to their first love: software for writers. It turned out that Chris and his writing partner Melanie had been tinkering with building an engine -- but not the kind that ran a vehicle. They were building a Story Engine -- a mechanism that would answer questions an author had about the development of his or her story's structure and the dramatic components required to build a powerful story. Stephen, being schooled in the Art of Writing, and then a produced screenwriter and member of the Writers Guild of America, had his doubts. It seemed highly improbable that his friends, a couple of young writers with only a few credits, could discover something new about the age-old art and craft of developing stories. Could Chris and Melanie's paradigm provide the basis for a program that would Assist in Structuring a Story, Chart the Physics of Plot, Describe the DNA of Drama, and Stir the very Cauldron of Creativity? And, more importantly, could Stephen write such an impossible program? Unlikely. Controversial. Laughable. Yet, after several years of development, their research begat the Dramatica® software, which has been bestowed with some of the most incredible accolades of any creative writing tool. The Dramatica® software was even granted a patent by the US Patent Office! The Brothers' Family Grows Around this time, in the mid '90s, the Write Brothers' little company exploded to a size of over 40 staff members, with 9,000 square feet of office space on three floors in the brick (facade) building across the street from their original 10 x 10 office. It was an exciting time to be developing software! During this period of remarkable rapid invention, several competitors to Scriptor sprouted up. Did this concern the Write Brothers®? Yes, as some of these programs seemed quite good. But the Write Brothers® had a plan: they had located an inventor of considerable talent, who shared their passion for fine writing software. His name was Ken, and he had spent years as a script coordinator, giving him an unequalled insight into exactly what features professional writers desired. His knowledge, his experience, and his software would become Movie Magic® Screenwriter™. Movie Magic® Screenwriter™ rapidly became a scripting tool preferred by top writers and directors in film and television. Most of the competitors that had sprouted up to compete with Scriptor in the 80's and 90's had now disappeared, fading into obscurity due to lack of development. Having addressed the needs of screenwriters, novelists, playwrights, and television writers, the dramatic duo planned to produce a tool that could be used by anyone with ideas. During their writing days before the dawn of the personal computer era, the two had experimented with outlining stories on Index Cards. For those born after 1980, the Index Card was the stone-age version of the Post-It Note. You wrote your ideas on a tiny (usually 3" x 5") paper card, then tacked it onto a wall or cork board. Stepping back from that wall gave you a sense of how your story flowed, and you could see by the empty space on your wall just how much work you had left to do. Once the Age of the Personal Computer arrived, paper cards were a painful way to go about outlining. First, they were limited in size. Second, they weren't very portable, because you had to take them down off your wall, causing you to lose your precious arrangement. So the Write Brothers developed StoryView, a visual outliner on steroids (but legal, nevertheless). StoryView gave writers tools to lay out the pieces of their story along a timeline, connect those story pieces to tracks, and produce gigantic wall-sized printouts that could serve as an excellent visualization and presentation tool. Very elegant. Ultra creative. As the Write Brothers® got more involved creating writing tools, it became increasingly difficult to split their attention between developing production tools and writing / creativity tools. In 1999, Budgeting and Scheduling were sold to Creative Planet (now Movie Magic Technologies), allowing writing and creativity to become the Write Brother's full focus. In 2002, with over twenty years of software development experience, the Write Brothers decided it was time to change the name of their company. Since their original incorporation 1982, the company had gone by the name of Screenplay Systems™. As they became focused exclusively on writing, creativity, and reference tools, it became obvious to the Write Brothers® that they needed a new corporate name. But what would it be? When asked if the pun is the lowest form of wit, he replied, "It is, and therefore the foundation of all wit." "A pun is the lowest form of humor - when you don't think of it first." "The wit of words. They are exactly the same to words which wit is to ideas, and consist in the sudden discovery of relations in language." "... plurality of reference is in the very nature of language, and its management and exploitation is one of the joys of writing." ...And the two chuckled. And the company was renamed. After Twenty Years the Company Moves! Just when it seemed the Brothers had endured the ultimate change, renaming the company, came another earth-shattering, paradigm-changing, mid-life crisis inspiring shift: the moving of the corporate headquarters from their beloved home in Burbank to neighboring Glendale. 348 East Olive Avenue, Suite H, Burbank, CA 91502.